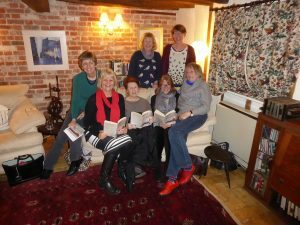 Since we formed our group in 2008 we have read and discussed over 100 books, from Jane Austen to John Le Carre. We meet at 8pm on the first Wednesday of each month at Stanton Road Farm, North Common, Hepworth. Books are provided by Suffolk Library service. If you would be interested in joining us please contact Kath Shearer on 01359 250594 or at kath@shearerclan.co.uk.